The background: Burberry's first pillar fragrance since the license moved from InterParfums to Coty, Burberry Her aims to evoke the youth, bustle, energy and creativity of London for women who are 'Londoners at heart'. It also appears to be aimed at increasing Burberry's share of the lucrative Asian market. The packaging: The bottle is meant to recall the brand's first fragrance, 1981's Burberrys for Men, but in blush pink. The advertising: Cara Delevingne does the London tourist route while singing Hubert Gregg's Maybe It's Because I'm a Londoner. What it smells like: Pretty much as promised. What you'll remember is the berries — the flowers are there if you go looking, but they don't stand out. Burberry Her is not an old-school fruity floral, though, or even an old-school gourmand. Here the berries are wrapped in an airy / guaze-y / clean amber-y musk, and so it wears like fruit salad only briefly before the sweetness is brought under control. The undertone is indeed dry, and at times there are flashes of bitterness. By 30 minutes in, it wears like a mild fruity musk, rather clean, lightly vanillic, with a pale dusting of powder. It does smell young, and it does smell blush pink. My verdict: I called My Burberry "likable and easy to wear", and I'd say the same for Burberry Her, with the proviso that while I do find it likable enough, I, personally, would just as soon not wear it. Kurkdjian succeeded in lightening it up, but he perhaps went too far to please a perfumista. It isn't quite bland, and it doesn't vanish into the ether in short order, but there isn't much there that I found interesting or memorable. 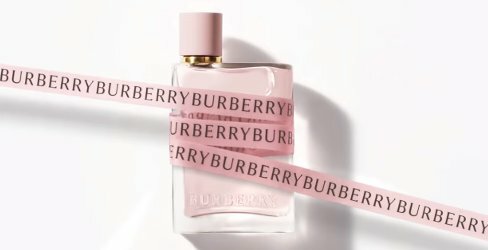 If I wanted a no-brainer from Burberry, there's the much prettier (and more sophisticated) My Burberry, or even better, Burberry Brit Rhythm for Her, which I noted was "not too young or too pinkified or too silly", and which I've come to like even more since I reviewed it back in 2014. If that one was still around in a rollerball, I might bite. The details: Burberry Her is available in 30, 50 and 100 ml Eau de Parfum ($70-121). A 7.5 ml rollerball is $29. 1. From Coty launches Burberry Her fragrance into travel retail at Moodie Davitt Report. Ha ! I just tested this today at Ulta while getting lunch. It smelled sour/bitter when sniffing the spray mechanism, and fruity with that same bitterness when sprayed in the air. Different, but not quite good. The notes written on the bottle made a point that this contains a ‘dry amber’. Macys had the red No 5 EDP and L’Eau, a deep burgundy rather than bright primary red. The overall impression on skin is not sour to me — too much blueberry and strawberry to be sour. I think if you put it on skin you’ll also find it loses the “different” aspect, though. I had a love affair with My Burberry when it came out, used up a 30ml bottle in no time, and it still has a soft spot in my heart, so I was quite interested when the news of Her came out. That just might be too much fruit for me though, but I will test it when it reaches the shelves over here. See what you think — this one seems much younger to me than My Burberry. Sounds about right. I love the bottle but musky fruit doesn’t sound fun to me. It could be a lot more fun than it is, although possibly without selling as well in Asia.